In my post, Why Do Groups Fail? Review of the Law of Triviality and Game Theory, we explored a philosophy of life as being a game, defined as social interactions. If we are the players in life's games, then who are our coaches? 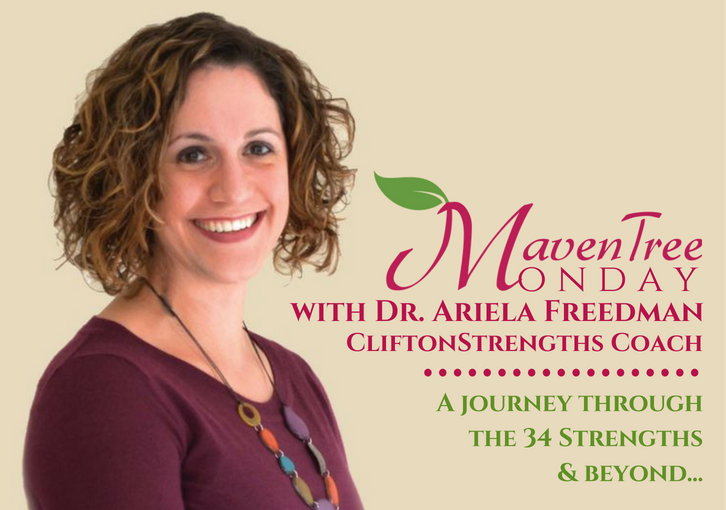 During my research, I met Dr. Ariela Freedman, a Gallup Certified Strengths Coach and owner of MavenTree Consulting. Ariela agreed to meet for coffee and conversations at Chocolate Coffee. We discussed how strengths-based coaching enables you to fully discover and apply your innate gifts to become the best version of yourself. Question: Ariela, you started your career as a high school English, Drama, and Debate teacher, but now you are a Gallup Certified Strengths Coach. Did you consciously decide on this path or did this path choose you? Ariela: The path decided me. Early in my career, I realized my fulfillment came from empowering students to build their own personal ‘toolbox’ of skills which would enable them to be successful in any environment. As a teacher, I focused on learning as a personal journey and not just arriving at a specific destination as dictated by education standards. In my classes, I created various ways students could learn by using their own voices instead of rote memorization of facts and figures. I was a Teach for America corps member in inner-Chicago, which was challenging, but very rewarding. Question: What does a PhD in Behavioral Sciences and Health Education encompass? Is it mostly psychology, social work, or both? How does this background help you as a strengths coach? Ariela: It is a mix of cognitive psychology and education. The Behavioral Science side is focused on understanding why people behave the way they do: What do they know about health? What skills do they have to be healthy? What beliefs do they have about health? The Health Education side is about developing programs to help people gain the knowledge, skills, and mindsets needed to live healthy lives. And when I say health, I am talking about physical and emotional/mental health. Strengths coaching and team building through strengths is a natural extension of these because I help people create healthy environments where everyone can thrive. Question: What’s the difference between a Strengths Coach and a therapist? Ariela: As a Strengths Coach, my goal is to help clients create the best versions of themselves. People have innate strengths which make them unique. Instead of conforming to ideas of how a person or organizations ‘Should Be’, we work in the space of how things actually ‘Are’. “Strengths envy”, a feeling that one’s talents are not sufficient, makes people feel that what they possess is not enough to be successful. We all have unique talents that the world needs. Our skills and talents serve a purpose, but we have to know how to use what we have! Question: When does a person/organization know when they are ready to work with a Strengths Coach? Ariela: Anyone could benefit from strengths coaching. I have done Strengths work with students, artists, mid-life career changers, doctors, academics, and clergy, among others. I’ve worked with leaders and managers and their teams, and I’ve also worked with individuals. My success stories are people and organizations driven to make changes instead of just talking about change. I enjoy working with clients who are passionate and open to new suggestions and want to use strengths coaching to enhance their lives. Question: You are the founder and owner of MavenTree Consulting. I invite readers to visit your website and subscribe to your newsletter to get a full list of your services. What is unique about your approach to strengths coaching? Ariela: I use a lot of different techniques in coaching and teaching strengths workshops: art, theater, etc. I keep it real, and I like to engage people through honesty and humor. My goal is to help clients establish strong roots to become grounded in themselves, their strengths and their values. I want people to walk away from each session feeling like they are truly awesome. Ariela: “Let’s play!” One of my strengths is “Activator” which is all about jumping in and learning as we go. I don’t need all the details before we get started – let’s jump in and do the thing, and let’s do it together!